Received 6 samples from Katie today. The box was labeled and stored @ -20C. This entry was posted in Samples Received and tagged Crassostrea gigas, gDNA, mantle, Pacific oyster, RNAlater on 10 December, 2015 by kubu4. Previously isolated gDNA from these tissues on 20150901. However, found out after the isolations that BGI needs &gt;73μg of gDNA for the genome sequencing project, which is significantly more than I obtained previously. After homogenization, topped off tubes to 1000μL with DNAzol and incubated @ RT for 10mins. Spec’d on Roberts Lab NanoDrop1000 (ThermoFisher) and stored temporarily at 4C to avoid freeze-thawing before sending off for sequencing. There was a great deal of insoluble material from the get-go that was carried through the entire isolation. Overall, the 260/280 ratios look pretty good, but the 260/230 ratios are just trash. As can be seen in the plots above, there is clearly significant absorbance in the 230 – 250nm, suggesting some contaminant carryover (phenol/salt). Will evaluate gDNA integrity on agarose gel. Total yield from this isolation is still below the minimum quantity of gDNA needed for the sequencing project. Will need to perform another round of gDNA isolation. This entry was posted in Olympia Oyster Genome Sequencing and tagged adductor muscle, DNA Isolation, DNA Quantification, gDNA, mantle, NanoDrop1000, olympia oyster, Ostrea lurida on 14 September, 2015 by kubu4. I previously checked Claire’s sheared DNA on the Bioanalyzer to verify the fragment size and to quantify the samples. 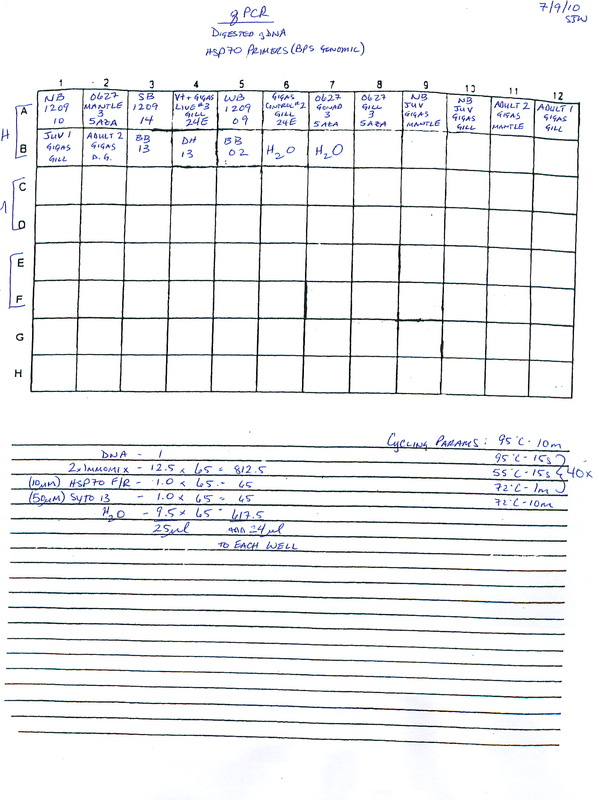 Looking at her notebook, her numbers differ greatly from the Bioanalyzer, possibly due to the fact that the DNA1000 assay chip used only measures DNA fragments up to 1000bp in size. If her shearing was incomplete, then there would be DNA fragments larger than 1000bp that wouldn’t have been measured by the Bioanalyzer. So, I decided to quantify the samples on the NanoDrop1000 (ThermoFisher) again. Comparison of NanoDrop1000 and Bioanalyzer measurements. 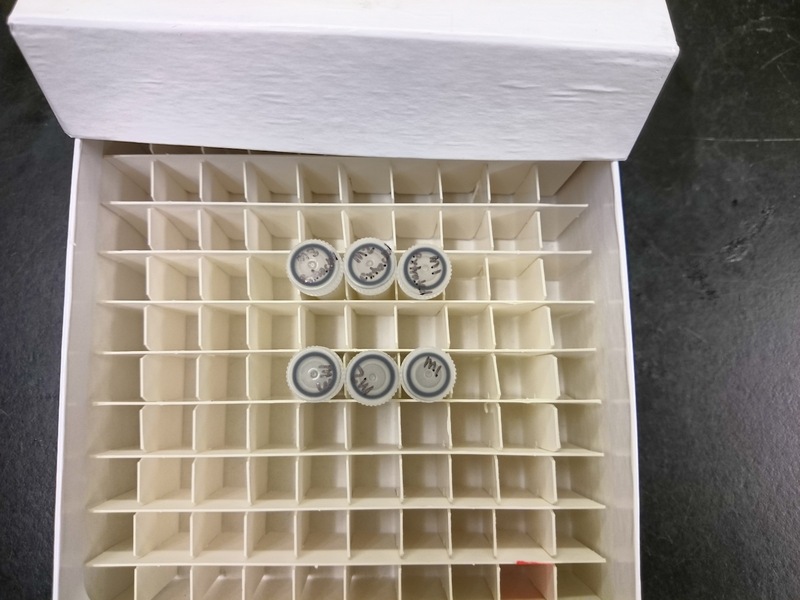 The NanoDrop is known to overestimate sample quantities due to the indiscriminate nature of UV spectrophotometry and that could be the reason for the large discrepancy between the two measurements (i.e. RNA carryover may lead to overestimation). As such, I’ll quantify the samples using a fluorescence-based assay for double stranded DNA tomorrow in hopes of getting the most accurate measurement. This entry was posted in Lineage-specific DNA methylation patterns in developing oysters and tagged Crassostrea gigas, DNA Quantification, graphs, heat shock, mantle, NanoDrop1000, Pacific oyster on 26 February, 2015 by kubu4. This entry was posted in Miscellaneous and tagged CFX96, COX, COX1, COX2, Crassostrea gigas, cyclooxygenase, Dg, digestive gland, EF1a, expression analysis, gill, graphs, mantle, muscle, Pacific oyster, PGS, PGS1, PGS2, prostaglandin synthase, qPCR, Vibrio exposure, Vibrio vulnificus on 15 March, 2011 by kubu4. 5ug of RNA was DNased using Ambion’s Turbo DNA-free kit, following the rigorous protocol (0.5uL of DNase for 30 mins then additional 0.5uL of DNase for 30mins). Calcs for DNase reactions are here. RNA was stored @ -80C in Shellfish RNA Boxes 4 and 5. Samples will be spec’d on Monday. Overall, the RNA looks really good (based on OD 260/280 numbers). Not surprisingly, the OD 260/230 values for all samples dropped, likely due to the addition of the buffer (salts) used in the DNase reaction. Emma says she will check these samples for residual DNA. 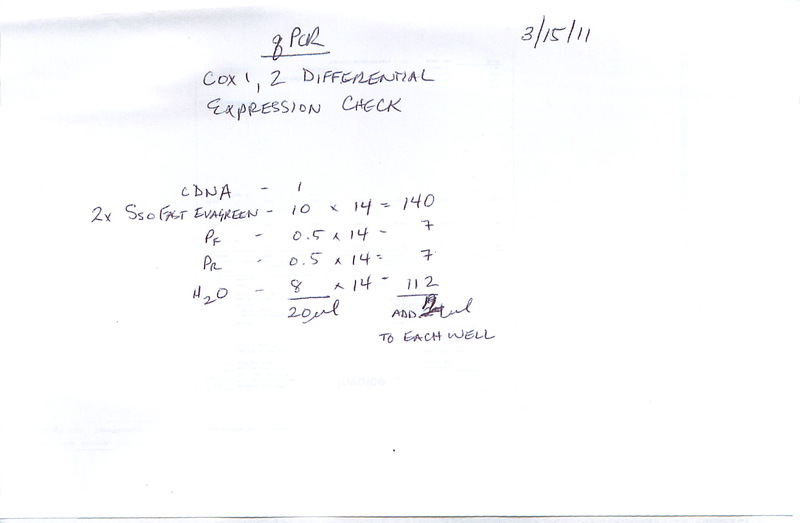 –UPDATE (20110131)– Emma checked all DNased RNA samples on 20110131 using C.gigas 18s primers (SR ID: ?). She has not listed the results of the whether or not all samples are clean or if some still have residual gDNA carryover. –UDPATE (20110201– Samples that appear to have residual gDNA carryover based on Emma’s qPCR on 20110131: Muscle C6, Gill 1hr C2 & E2. This entry was posted in Miscellaneous and tagged Crassostrea gigas, digestive gland, DNase, DNased RNA, gill, gonad, mantle, NanoDrop1000 on 28 January, 2011 by kubu4. RNA looks OK. Not surprising, but mantle and Dg/Gonad tissues ended up with poor OD260/230 ratios. This has been observed in the past with these tissue types. This entry was posted in Miscellaneous and tagged Crassostrea gigas, digestive gland, gonad, mantle, NanoDrop1000, Pacific oyster, RNA isolation, RNA quantification, TriReagent on 24 January, 2011 by kubu4. This entry was posted in Miscellaneous and tagged CFX96, COX, Crassostrea gigas, cyclooxygenase, digestive gland, gill, mantle, muscle, Pacific oyster, prostaglandin synthase, qPCR on 10 December, 2010 by kubu4.